Last night I enjoyed an evening with new friends. The topic that I wrote about 2 months ago in one of my featured posts on this blog came up again as we talked about the #Ray Rice situation and where “we” should look for solutions. My perspective was new to my friends, but was recognized as a valuable insight. I have found that amongst the chatter of public opinion, there is seldom a listening ear regarding the truth about where the solution has to begin. Here is a condensed version of my original post. The violence of the football culture and the many NFL players who have perpetrated violence against their intimate partners provide all of the evidence for where the real problems and “preventative measures” can be found – but you have to know where to look and be willing to go there. Before I go on, it is important to point out that according to a study reported in Social Issues in Sport, up to 21.4% of NFL players had records of more than minor crimes. The NFL Arrests Database lists the crimes on record since 2000. You may argue that this means that almost 80% of players don’t have violent backgrounds. But if we are talking about 1000 NFL players, that means that 214 women are potential victims – assuming that a violent NFL player only victimizes one woman. I believe you would agree with me that if the number is 214, it is 214 too many. I must also add that less than 25% of intimate partner violence is reported – and the recent decision to retract Rice’s contract is likely to make him and other abusive men more secretive rather than less violent. When I’ve read that women fans of the Baltimore Ravens continue to support Rice because he’s such a “nice” and “sincere” guy, I recognize that no one on the outside of an abusive relationship sees the wolf in the sheep costume. That’s the usual drill. It’s how abusive people maintain power and control of their relationships. A young child (in this case, male) is traumatized or exposed to violence. That child is not taught healthy ways to deal with loss, trauma or violence. That child learns that rather than feeling vulnerable, he can overcome fears, injustice and pain by converting his pain into anger. The child’s emotional maturity gets stunted and the pain festers into explosive outbursts. During childhood, this is usually considered a tantrum. Anything that reminds the child of the pain results in a tantrum. When a 218 pound man with the emotional maturity of a child is reminded of pain, his tantrum is dangerous. Since the current firestorm surrounds your boy Ray Rice, let’s apply his specifics to this formula. His father was killed by gunfire intended for someone else when Ray was 1 year old. She is quoted as saying: “Ray stepped into some big shoes at a very early age. He was a man before he was a boy.” After losing his biological father and his surrogate father, Ray didn’t have time to make sense of his losses. And his mother placed a responsibility on a child’s shoulders that would create stress of a magnitude that is far too great for a child of that age to manage without repercussions. He loves his mother and continues to be close to her. But the family lived on public assistance and Ray took on the responsibility for bringing money home to help his mother from as early as age 8. By the 11th grade, he is quoted as saying he was going to make it to the NFL so that his mother wouldn’t have to work. Ray’s need for the basic essentials of life became his responsibility when his cousin died. Proof is the continued concern that his mother doesn’t have to work so hard. But how? Ray’s solution was to become a NFL player. He saw that as the solution to poverty. His father, whom he had learned was a “respectable man” and his cousin who had always encouraged him to reach for his dreams was replaced by another father figure: his football coach. Now let’s add football to the formula. Football is an aggressive sport characterized by the mentality that the more aggressive a player is, the more successful he will be. Football coaches develop aggression in their players by yelling at them, cursing at them, demanding obedience to their commands and demanding perfection. Successful football players (if the NFL is any indication) can be heard cursing, growling and yelling as if they are running off to a war and the war cry fuels the aggressive energy they need to win at all costs. The football field is a war zone where men are encouraged by the NFL machine to risk their bodies and well-being in exchange for the fame, notoriety and wealth. In Ray’s case, NFL held the promise of never seeing his mother impoverished again. And his high school football coach, whether he realized it or not, encouraged a traumatized, grieving young man to turn the energy of his losses into aggression. To fight when he feels emotional pain. The side effect of fighting aggressively in response to emotional pain is that the release of the physical aggression leads to the release of the built-up painful emotions that the person using aggression would rather not experience. The misdirection of unresolved losses onto the football field leads to the misinterpretation that painful emotions should be responded to with a similar dynamic of power and control. When we apply this information to intimate relationships and in keeping with the war metaphor, let’s just say that Ray Rice’s unresolved childhood trauma results in his being a 37 year old, 218 pound man who has what I would call landmines inside him related to loss of his father and cousin and fears for his mother’s well-being. All of us have things to overcome that started in childhood. When we get into close relationships with other people, those leftovers can cause us to behave badly. But it is the job of every grown-up to do the emotional work of clearing the internal “landmines” so that innocent people will not suffer the consequences of our childhood pain. 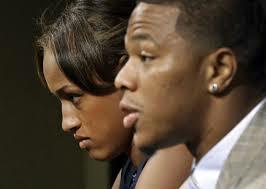 I don’t know what happened between Ray Rice and his then fiance/now wife before that 218 man threw a tantrum that led to knocking her out cold and dragging her, face-down out of the elevator and shaking her limp body to get her to come to. I don’t know why he didn’t seem to show any concern for her as she began to regain consciousness. But I can surely imagine that if we asked him (and he were honest), he would say something about the landmine that she tripped over without even knowing it. And if she knew there was a landmine there, was it her responsibility or his to make sure she remained conscious instead of knocked-out because of what she said or did? The unfortunate result of this whole situation is that, in the end, Rice is likely to run out of money. Because of that, he is unlikely to be able to ensure his mother remains outside of the grips of poverty. And, like most abusive men, he will probably take it out on Janay, blaming her for their misfortune rather than attending to his childhood demons. By her own admission, Janay probably doesn’t see herself as a battered woman. Unfortunately, that may cost her her life. 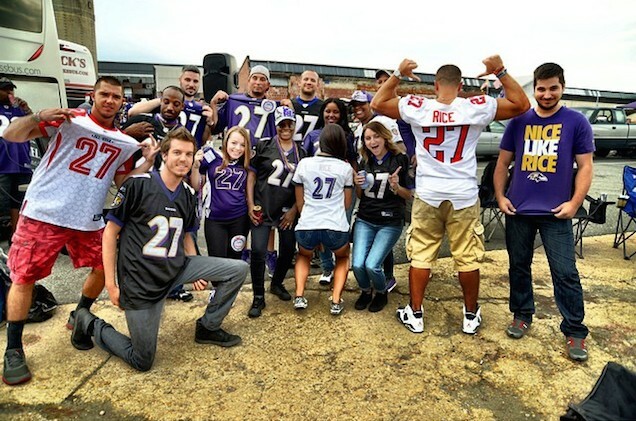 The NFL and the Ravens didn’t solve a problem with their disciplinary action toward Ray Rice. They just sent a signal that abusive players should be more careful not to get caught. The answer lies in resolving the underlying issues. When is the NFL going to look there for solutions? ← Will I Ever Be Able to Trust Again?